My 5th Cousin 2 times removed John (1882-1917) died in the Speculator copper mine disaster in Butte, Montanna, USA, in 1917. I believe John was born in Lancashire but must have emigrated to the USA in the early 1900's. John's brother Thomas (1887-1838) must have also emigrated as he died in Butte in 1938 aged 51. 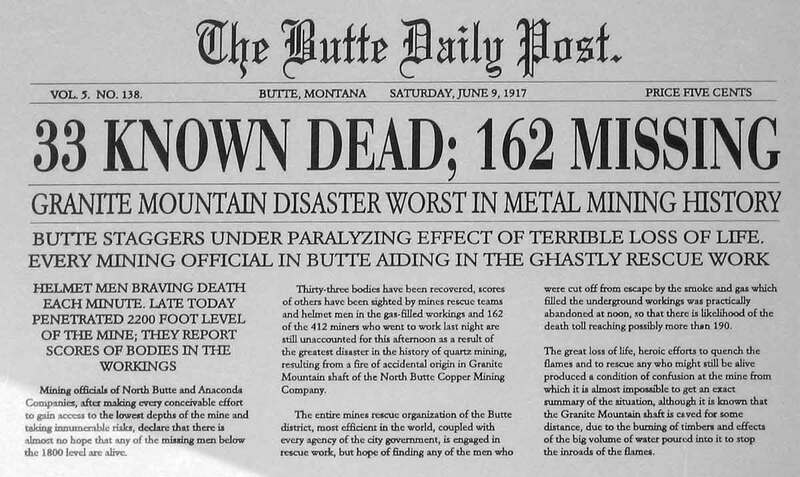 The mining disaster remains to this day the worst mining disaster Butte has ever known. The United States had been at war over two months on the night of June 8, 1917. War industries were clamoring for copper. Every mine in Butte was working to capacity. Among them was the big Speculator, with close to two thousand miners employed on the two shifts. Oddly, it was at the Speculator where the "Safety First" campaign had been most stressed. A crew of safety engineers was employed. All modern safety improvements and practices had been installed, and motion pictures showing safety methods were periodically shown to the employees. Attendance was compulsory. The "Company" was desirous of keeping accidents at a minimum and did not tolerate the slightest infraction of safety rules. But on that June evening, the night shift of some nine hundred men had been lowered and were at work. During the late afternoon and evening, ropemen and shaftmen had been lowering a huge, insulated electric cable to operate the ventilating fans on the lower levels. The heavy cable had somehow become fouled and was hanging suspended in the shaft. For some time the workers had been vainly trying to free it. The assistant foreman on the night shift had descended to aid in the difficulty. The cable was an old one, with the insulation in some places frayed and worn. Sallau, the assistant foreman, his carbide light in hand, was examining it in an endeavor to find some way of breaking the tangle and getting it started down the shaft once more. In some inexplicable manner, his carbide light came in contact with the frayed edge of the insulation. Like a lighted match dropped in gasoline, the insulation burst into flame. Acting as a chimney, the draft in the up-cast shaft pulled the flames toward the surface, and in an instant the entire length of the cable was ablaze. As the dry shaft timber caught fire, it was but a moment before the entire three thousand feet of shaft had been turned into an inferno. At the first flash, Sallau and his assistants hurriedly descended out of danger, below the path of the flames. But now the damage was done. Any effort on their part to prevent the spread of the fire was hopeless and would undoubtedly have lead to their cremation. It was but a few moments before the flames were shooting out of the mouth of the shaft on surface, consuming with incalculable speed the dry timbers, and forcing the deadly smoke and gas onto every level in the mine. An instant before the cable was ignited the mine cage with two station tenders aboard had been lowered into the mine. Hardly had it disappeared from surface before flames bellowed forth from the mouth of the shaft. The hapless men had been lowered into a flaming furnace. Too late, the engineer on duty discovered their peril. It was some time later that the white hot cage was brought back to surface. A few charred bones and metal overall buttons were all that remained on its scorched deck. Underground, on every level, the scene was the same. Many of the miners, smelling the first whiff of smoke had made a run for it and escaped through the levels of other mines adjoining the Speculator. Fortunately there were connections to neighboring mines on almost every level. These men were quickly hoisted to the surface. On the eighteen hundred foot level of the Speculator, two hundred men escaped into the Badger State Mine by battering their way through a fifteen inch concrete bulkhead with sledge hammers and heavy timbers. On the surface at the mouth of the blazing shaft, any rescue work until the fire had burned itself out, was impossible. Word was sent to all other mines in the camp for rescue crews. In answer to the call came ambulances, trucks and other vehicles carrying first aid and fire fighting equipment. The presence of "dead wagons" and hearses offered a grim foreboding. News had spread rapidly in the city, and thousands came to the mineyards. Scenes were pathetic as those having loved ones below gazed with frantic appeal at the smoking shaft. Statements gathered from the rescued as they arrived from the other mines were practically all the same. Miners had been compelled to feel their way in the darkness of the drifts and cross-cuts. One of their number who knew the way advanced ahead of the others. Those behind formed a human chain, each holding to the one ahead of him, and staggered blindly through the gases that. were becoming stronger minute by minute. The rescued told harrowing tales of hundreds of their fellow workers lying dead throughout the mine where they had fallen. Without number were the stories of heroism of the miners. If feats of bravery could have saved the scores of entombed men there would have been but few fatalities, for never were more heroic sacrifices made in any mining catastrophe. Many in the copper camp are alive today because of the deeds of their fellow workers. Gas from the Speculator had swept into the Diamond Mine almost immediately. Luckily, however, most of the miners employed in this mine had time to reach the safety of the mine cages and were hoisted to the surface. Not all were so fortunate. Con O'Neil, foreman of the mine, and three miners were trapped by the on rushing gas and died gasping in their tracks. Hours later, as the fire in the Speculator burned itself out, an attempt was made to enter. Over a dozen volunteers were loaded on the mine cage, among them, the assistant foreman, Sallau, whose carbide light had inadvertently caused the blaze. As the cage reached its destination and the rescuers stepped off, they were met by a blast of the deadly gas and all perished on the turn-sheets of the station. Further attempts at rescue were abandoned until fresh air had been pumped into the mine. Butte was stunned and shocked. A rapid check of the survivors indicated that over two hundred miners had been trapped below. Barring a miracle, all had perished, for survivors had reported seeing the drifts and stations strewn with dead. Scenes in the mine yard were heartrending. The hospitals were crowded with the injured. Thousands crowded frantically seeking word of some loved one. Regular army soldiers, stationed on guard duty in Butte at the time, were pressed into service and endeavored to keep some semblance of order. Two days and a night had passed since the first flames had swept up the shaft. Fresh air was being pumped into the mine, and safety engineers decided that at last it was safe for rescue squads to descend to bring up the bodies of the victims. All hope of anyone being alive in the mine had long been abandoned. It was then that a small miracle happened. Sitting in his chair in the engine room, the engineer of the Speculator was astonished to hear a signal flash from the depths where a moment before he had been positive there was no living person. Somewhere below, someone had escaped the deadly gas. Again the signal flashed. Startled into instant action, he threw the various levers and throttles. The giant engine hummed, the cable unwound from the whirling drums, and the cage descended to the level the engine room indicator showed the signal had come from. A brief pause and again a signal this time to hoist. Up came the cage. Before the astonished eyes of the hundreds who had crowded around the shaft, nine men blackened and haggard stepped from the cage, blinking in the sudden sunlight but bringing the joyous news that sixteen more of their fellows were alive below and waiting to be hoisted. Down the shaft and up again traveled the cage, until in all, twenty-five miners had been brought back from the dead into the sunlight of the mineyard. It was a startling tale these survivors told a story of the heroism and sacrifices of one man who died that others might live, the story of Manus Duggan, a common miner, a simple tale of heroism, but twenty five Butte miners owed their lives to Duggan's act. Within an hour after the fire started, the twenty five year old miner marshalled a group of twenty nine men and gathered them together in a cross-cut into which the deadly gas had not yet penetrated. Hastily erecting a makeshift bulkhead of timber, canvas, clothing and dirt, he took charge of the little group of men in the small, cramped cross-cut, keeping up their morale and preventing them from making the break for a supposed safety that would certainly have meant their end. As tiny apertures appeared in the bulkhead, Duggan forced them to strip their clothing from their bodies to plug the gaps and keep out the gas. As the long hours passed, breathing became more and more difficult. When Duggan saw at last that it was only a matter of minutes before they would all succumb, he decided to seek a path of safety for his charges. Taking three of the men, he set out to find a safe path into some other mine, intending, if successful, to come back and guide those left behind. Manus Duggan and his three followers never returned. Days later their blackened bodies were found in a drift where they had fallen. The remainder of the little band, after waiting a reasonable time for Duggan's return, decided to chance everything in a rush for the station. Any risk was better than slow death in the cross-cut. Desperately they set out in a group. To their joy and surprise on reaching the station they found pure air. The air pumps had done their work well. Frantically, delirious with joy, they gave the station signal and rang for the cage. Butte received news of their rescue with elation. Houses of sorrow changed into homes of rejoicing as the rescued men returned. On all sides were words of praise for the hero, Manus Duggan. His and three small children were offered the sympathy of the city. For weeks the copper camp mourned. Both private and public funerals were held. Identification of the one hundred and sixty-three bodies recovered was difficult, and many were never identified. The North Butte Mining Company estimated damage to the mine at a million dollars. Compensation to dependents of the victims totaled $800,000; about $4000 for the life of each miner. To date, it is the camp's greatest disaster. There has not been a major accident since, but the town knocks on wood, the mines are never too safe and anything can happen underground.